British singer/songwriter Ed Sheeran, the man capable of selling out a stadium with nothing but a guitar and a loop pedal, firmly establishes himself as one of the leading presences at the forefront of pop music with his third studio album and first #1 hit single (“Shape Of You”). It’s been a steady rise to the top, but with the consistent quality of his work and tirelessly competitive edge that drives him to improvement, Sheeran continues to achieve the lofty goals he sets out for himself. Outside of the tailor-made hit single that you might hear whenever a radio is switched on at the moment, ÷ certainly didn’t go full bubblegum pop like some other stars tend to when they reach this level of widespread appeal. In fact, it might have significantly less of that kind of material than 2014’s X. Taking a break from social media and travelling over the past year has seemingly opened Sheeran up to a diverse range of musical influences, and he really has the raw talent to make anything at all work. There are much less personnel on this album than the typical A-list pop star release, speaking volumes to the degree of Sheeran’s own input. Almost every track is produced by some combination of close friend and frequent collaborator Johnny McDaid, pop mastermind Benny Blanco (Maroon 5, Justin Bieber), and Sheeran himself. Sheeran also has primary writing credit on every song, with the assistance of Blanco or one of a few well-established pop songwriters. OneRepublic frontman Ryan Tedder, folk breakout Foy Vance and Julia Michaels, quickly establishing a solo career of her own, all appear here. These are all mostly the trademark passionately sung, well-written and guitar-driven tracks that we know and love him for, but applied to a wide range of styles. For example, “Dive” features a beautiful foray into the doo-wop sound you never knew Sheeran could dominate in this way, while “Galway Girl” gives a modern update to what sounds like an Irish folk song, a track that is outside the norm to just the right amount – Sheeran had to fight the label to keep it on. 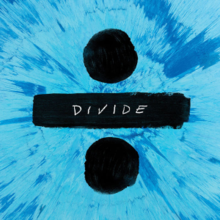 Right off the bat, we’re reminded Sheeran can rap on opener “Eraser” – this is usually the best display of his lyricism, and this track basically serves as an update on the status of Sheeran’s feelings towards his position in the music industry. Having at least one track like this on each album is an interesting insight to the foundation of the strong hip-hop influence in his uptempo tracks. More importantly, however, Sheeran can SING – the passion and emotional involvement he puts into the delivery of every song is the number one thing that makes him so appealing. This can manifest in the strain from putting so much feeling into the words his voice reaches its breaking point on songs like “Dive”, or quieting things down to deliver something like a touching elegy to his late grandmother on closer “Supermarket Flowers”. His actual vocal abilities, as well, especially his range, consistently surprise and put him ahead of all of his contemporaries save for maybe Bruno Mars. Sheeran’s lyrics can make you both laugh and cry and can be emotionally affecting like nobody else. When he describes the scene in detail on “Happier” of observing the interactions between his ex-girlfriend and her new man in a bar, before admitting he was happier with her, your heart breaks along with his struggle to accept his situation. Of course, he then turns it around on forthcoming track “New Man”, hilariously mocking the stereotypical characteristics of this bland and typically “popular” man. Some other standout tracks include “Perfect”, where Sheeran endears us to his cheesy romantic lyrics in the way only he can, and “How Would You Feel (Paean)”, another love ballad which calls back to debut album + with its acoustic guitar and piano and features a guitar solo from John Mayer. One of the only criticisms I could possibly have about this album is that there are certain songs where connections to corresponding tracks on X could be easily drawn, but Sheeran said himself that he had these songs in mind and was trying to improve upon them, which he certainly did. “New Man” is a better “Don’t”. “Hearts Don’t Break Around Here” is a better “Tenerife Sea”. The only time there is a lapse in me being completely captivated by Sheeran’s many talents is perhaps “What Do I Know?”, where the repetitive guitar loop and chorus melody are still very catchy, but more basic. What it makes up for in interesting music, it makes up for in interesting lyrics acknowledging the tricky relationship between artists and controversial topics, Sheeran ultimately choosing to avoid them but offering his music as a catalyst for peaceful change. Sheeran has improved with every album release, and makes me believe that a ginger-haired and socially awkward guy who likes to rap could fully achieve all the plans he outlines in interviews to conquer the world. The natural talent he has is in an extraordinary realm, and with the self-awareness he has to identify what didn’t work in his past and improve it, we might not have even heard Sheeran’s best yet. Least Favourite Track: What Do I Know?